Holding it together was far preferable to allowing an international free for all. Agreeing among themselves was preferable to cooperating with small, poor and troublesome nations at the United Nations. That’s why they invented this system of global policymaking. But the global elite has fractured. In the run-up to the Hamburg G20, the talk was of the global strongmen who had taken centre stage, for whom diplomacy was simply war by other means. The power of Trump, Putin, Erdogan and their ilk derives from a form of nationalism that believes global rules are for the weak. The G20 came to prominence in 2008 after the financial crash meant the richest G8 countries needed the wealth of emerging nations to stabilise the world economy. The likes of Saudi Arabia and Turkey were granted a seat at the table. In London in 2009, they patted themselves on the back on a job well done. But their reforms were too timid, too beholden to the free-market ideology that caused the crash in the first place. Today that crash haunts this G20 like a ghost that won’t be exorcised. This G20 will pitch the “strongmen” against the “moderates” – Merkel, Macron, Trudeau. The latter might look nicer, talk nicer and act nicer. Merkel has put climate change, migration and free trade on the agenda, much to the chagrin of Trump. We shouldn’t be fooled. The G20 agenda utterly fails to break with the tired, broken policies of the free market. In other words, those very policies which, by increasing inequality and devastating communities, turning everyone into a self-interested individual, have unwittingly given rise to the likes of Trump. And that’s to ignore the “Trumpism” in European politics – the barbaric immigration policy at Europe’s borders through which thousands of desperate migrants die in the Mediterranean every year. Sure, Merkel wants cooperation on climate change and thinks globalisation should work for the many, not the few. Who can disagree? But what does that really mean? A desperate attempt to restore the system that was destroyed on the day Lehman Brothers collapsed. 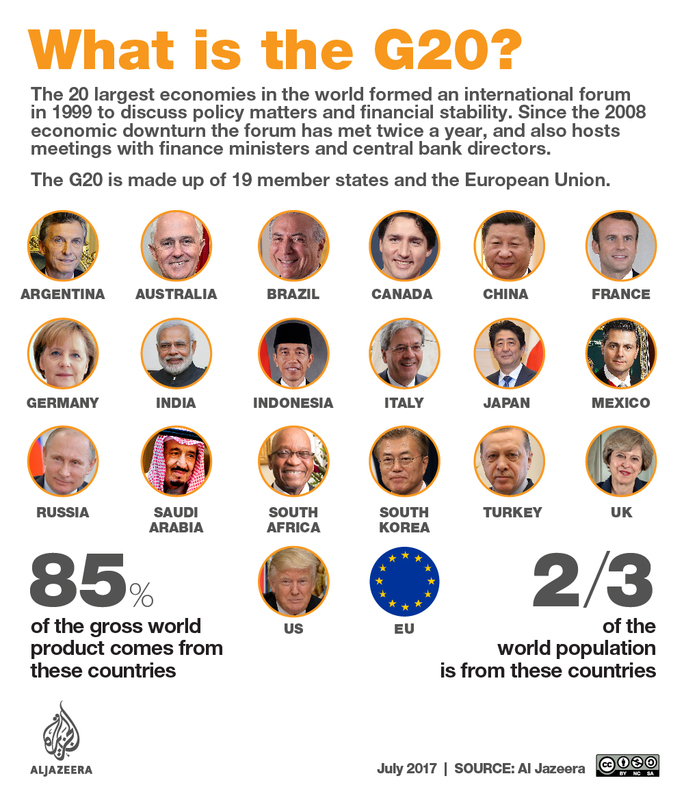 The G20 agenda talks about the need for structural reforms to reduce debt. Like those deeply anti-social policies the European Union has imposed on Greece for the last eight years, which have devastated that country and its people? OPINION: Are protests enough to bring down the G20? International capital flows are good, the G20 agenda tells us. For whom? Unregulated capital flows have sunk economies from Jakarta to Istanbul, with millions losing jobs and livelihoods as a result. Agribusiness can feed the world, we’re told. Yet there is already more than enough food in the world to feed 10 billion people – so how do 800 million go to bed hungry every night? How is the further displacement of small farmers to make way for monocrops going to help? Merkel crowns her benevolent agenda a “Partnership for Africa”. But as Zimbabwean activist Fanwell Bokosi told this week’s G20 counter-summit – “a partnership normally means both sides are at the table and agree”. In fact, this partnership is about using Western aid and power to politely suggest African countries might want to change their policies to make life easier for western multinationals to “invest” in their countries. It also means they will be able to avoid their taxes, and repatriate their profits back to the west when they’ve fleeced the continent. Even mainstream economists and newspapers are unimpressed. Jeffrey Sachs gave a despairing speech before the conference began, essentially saying 20 people can’t solve these problems – especially not these 20 people. Liberal German daily Der Spiegel said, under a leader titled “the G20 farce”, “the group meeting here is an exclusive club that is mostly interested in preserving a creaking system of financial market-driven capitalism”. Which is why there is such support for the protesters in Germany this week. The tectonic plates of global power are moving, and only a new politics can get us out of this mess. If we want to preserve the openness of globalisation, the only way is through regulation – of capital, of big business, of trade. There is no other way that the incredible riches of our world can be shared by the many. What does this look like? The G20 fear a healthcare crisis as antibiotics stop working. So scrap intellectual property rights for drugs companies, and use public funding to insist on public priorities in medical research, and access for all. Climate change? Urgently reduce carbon emissions and put massive funding into helping developing countries develop free of fossil fuels. Terrorism? The simplest of all. The G20 are the biggest backers of terrorism in the world. Stop it, and put real effort into creating a world order based on peace and cooperation in a properly funded and functional UN. The G20 cannot or will not adopt such an agenda. Only massive popular action can bring it about. Who knows, they may patch together the vaguest of communiques from the Hamburg G20 in the next 24 hours. But it will represent no more than an attempt to hold together a creaking building, slowly collapsing in on itself, with a piece of sticky tape. This is the end of something. What will come next? That is still to be decided – and it depends on us.